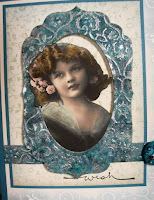 Vada's Blog Stamp Inks and Paper : Gessoed Al. Today I thought I would give Shelly Hickox’s Technique called “Gessoed Al“ a try. You can get the instructions on the Gingersnaps Blog. Doesn’t this little frame just jump off the page? It is so very rich and full of texture. I added Neutral Shadows around the outer mat. The little lady graphic is from “Magic Moonlight Graphic’s”. Stamps credits are, Inkadinkado and Stampin’ Up. 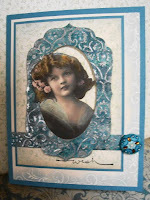 Please stop over to Gingersnap Blog and give this TQ a try. I’m sure you will love it as much as I do. Labels: Gingersnap Blog, Magic Moonlight Free Images, Technique Junkie Newsletter. Holy Cow! That frame is stunning! Love how you have her out of the frame! Beautiful as always! She is beautiful! Love the frame, I will have to give that technique a try. Gorgeous Vada! the teal is so pretty and the little girl, what a charmer! This is Gorgeous! I saw that tutorial yesterday, you really took it to a new height with this!